In beautiful Cyclades, in enchanting Santorini, the island of dreams and love, and in Firostefani area , one finds Ersi villas with modern facilities for pleasurable vacations. 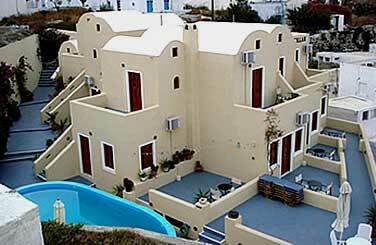 The Ersi Villas offers quaint accommodation on te island of Santorini Greece one of the Cyclades� unique Mediterranean destinations. The villas, conjoined in a cluster, feature traditional influences within a calm atmosphere. Ersi�s Charming guestrooms use rustic decor while the outdoor pool area allows for relaxation amid the close-knit municipalities of Santorini.